Edward had been enjoying fashion week so far. He’d had a raging hangover every day but then so had everyone else at work so it went unnoticed. Gloria Gaynor had sang “I am what I am” at the Moschino show last night. Terrific! He met a cute guy from Cavalli PR office who promised to get him a copy of the still-unpublished Roberto Cavalli autobiography. Yes, please! He knew it would be juicy as a Jackie Collins. Of course, there were some standout shows too. Always partial to Giorgio Armani, Edward thought his women were always on their way somewhere, going places, striding through airports or crossing helipads. At the very least they were striding out of stores with multiple shopping bags the short distance to their waiting cars. Pretty Woman was one of his favorite films. Dolce & Gabbana made a powerful statement. They were about to go to jail for tax evasion and they showed a dress of gold coins. They must have balls made of gold too, he thought, in admiration. Oh, I love fashion! I am what I am, I am my own special creation; So come take a look, give me the hook or the ovation! Always a fan of the Sicilian duo, he knew they wouldn’t go down without a fight. This was Italy; legal loopholes and criminal activity were two sides of the same gold coin. Edward was a sucker for their little black dresses. Look at this one! The merry widow who’s not feeling much grief. Those shoes say it all. She’s ready to go on the run, with all her late husband’s, or the taxman’s, money. Ciao, ragazzi! I won’t be seeing ya! 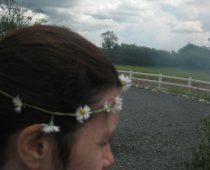 It’s my world that I wanna have a little pride in; My world and it’s not a place I have to hide in. Life’s not worth a damn, till you can say I am what I am! Edward liked a glossy, lacquered woman with a supermodel era physique and sultry face. But there was something about this model in the Cavalli show that reminded him of the boy he had a crush on in school. He had been following her on the different catwalks. Nastya Sten looked like Tony Holborn. The sticky out ears, elfin features––but as it turned out, not a little fairy like him. Married with kids, living in Solihull. Roberto Cavalli make him nostalgic. He loved Nastya’s look too. 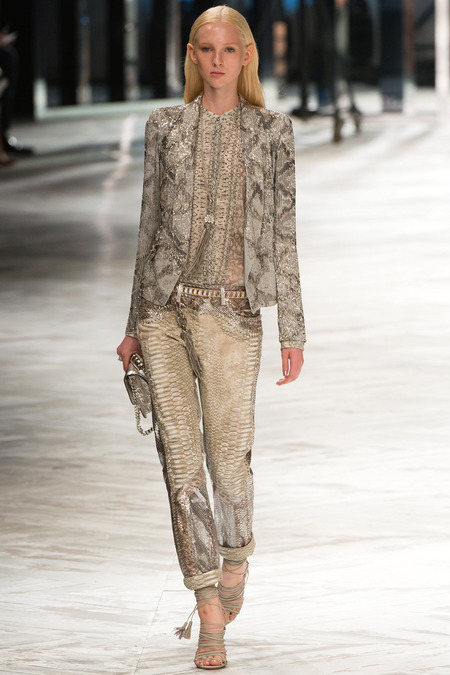 Layer upon layer of reptile print and reptile skins, lush. And then a caftan, oh yes! All she needs is a cigarette holder, a martini glass and a jilted lover. Edward was partial to a caftan. I am what I am, I don’t want praise, I don’t want pity. I bang my own drum; some think it’s noise, I think it’s pretty. And so what if I love each feather and each bangle. Why not try to see things from a different angle.Your life is a sham till you can shout out loud: I am what I am! He wished more women would be more interested in dressing like the screen goddesses of old. 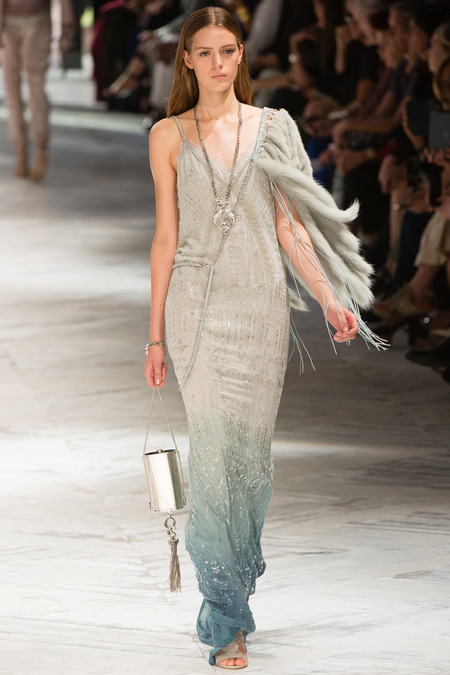 Cavalli could be relied on to bring back the spirit of Jean Harlow, Lana Turner, Rita Hayworth. But look! Fur, beads and a bias cut all in one dress! Cavalli evokes the spirit of the silver screen and Edward swoons. As a menswear designer, Edward enjoyed the feeling of being the director of his own silver screen and his female friends were his starlets. He would never want to design womenswear but he certainly had his opinions to air on the subject. Versace never disappointed him. It takes a woman of a certain strength to support a length of chainmail swinging from her bosoms. It’s not for everyone. He recognized that. Lana Turner could pull it off though. Like Edward himself, his women were always on the prowl. Life was too short to miss an opportunity. If you are blessed with the body, dress it generously. Lounging by the swimming pool of a glamourous Dubai hotel, you are not required to swim. God forbid. No, you choose a swimsuit as elaborately draped and wrapped as as an Indian wedding sari. With the right heels and and a seductive pose that you can maintain until cocktail hour, nothing should slip or pop out and, apart from the tan lines, you should be fine. Kat often tells him if he was a female he would be one of her Lionesses. Life’s not worth a damn till you can say, hey world, I am what I am! Thank you, Missy. Love having you stop by! Mama…your writing is so damn detailed and juicy. Makes it all come alive. You are a rare bird sister! I’m so proud. Oh thank you, Cyndie. That’s sweet of you to say.